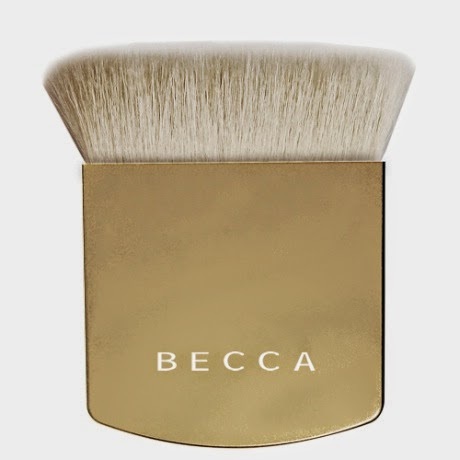 A great gift for any beauty lover that hates cluttering up her vanity with too many makeup brushes is BECCA’s Holiday Collection One Perfecting Brush in Limited Edition Gold ($49) that I have been playing with since it arrived a few days ago. With this very attractive brush you can switch from liquids like your foundation, primer, cream blushes, concealer to dry powder cosmetics like bronzers, finishing powders and highlighters without blinking an eye. The natural hair bristles are packed in a 3.5 inch horizontal design with flat edges. I liked how nicely this brush smoothed my primer and then doubled for spreading my liquid foundation to save me time. The way this brush covered in a few sweeps practically hid all the pores. I think my favorite part about the One Perfecting Brush is how adaptable it is to your needs and the various techniques you use to apply cosmetics like blending or stippling for instance. I must admit it did shed some hairs the first few times I used it, which the company says is natural on their website. I haven’t noticed more lately so I am pleased because I do like all the tasks and maneuvering that I can do with it. Have you gotten your pretty hands on one of these brushes yet? You can find the BECCA Holiday Collection One Perfecting Brush at Sephora and ULTA Beauty stores and at Sephora.com and ULTA.com. I have not tried her brushes, but I do love her foundations.